The modern virtue-signalers are expressing outrage again. This time the opprobrium is aimed at State Representative Stephanie Borowicz and her actions this week before the Pennsylvania House of Representatives. What was the legislator’s offense? In response to being asked to pray, she dared to do so with repeated reference to a particular deity popular with many Americans: Jesus Christ. And she happened to offer this prayer on the same day that the first Muslim woman in Pennsylvania history took vows to serve in the legislature. One can watch this legislator’s prayer here. It’s less than two minutes long. She invokes the “J-word” repeatedly. She prays specifically for the peace of Jerusalem. She prays a prayer of thanks for President Trump standing with Israel — America’s strongest ally in the Middle East. She recites passages from well-known Hebrew and Christian scriptures — passages recited by Christians and Jews for millennia, emphasizing themes like forgiveness and the Lordship of Christ. What most unnerved Borowicz’s critics is that she went on for nearly two minutes — typically considered a bit too long for a prayer in this kind of setting, and especially given the content of the prayer. And yet, for anyone with even a passing familiarity of evangelical theology or practice, none of the content or style would have been surprising in the least. It wasn’t unusual, at least in evangelical circles. What was the response? Representative Movita Johnson-Harrell, the Muslim Democrat who was sworn in later that day, said that the prayer “represented the Islamophobia that exists among some leaders” and was “highly offensive to me, my guests, and other members of this House.” Interestingly, Rep. Borowicz never mentioned Islam, Muhammad, or the Koran during the prayer. Johnson-Harrell wasn’t the only one to cry foul. 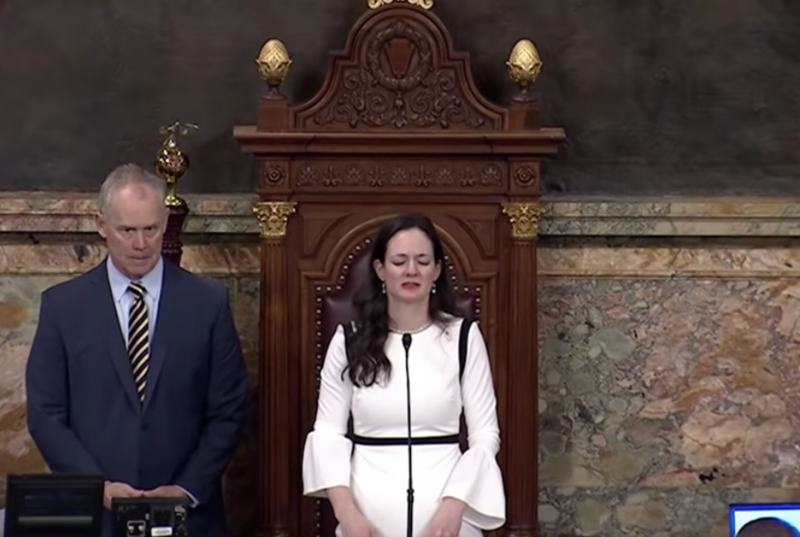 The Washington Post framed Borowicz’s prayer this way: “GOP legislator prays to Jesus for forgiveness before state’s first Muslim woman swears in.” Never mind that the prayer for forgiveness had absolutely nothing to do with the swearing in of the Muslim member. And never mind that a Muslim offered the opening prayer the following day. Now, I’ll be honest. As a confessional Presbyterian, I’m not particularly fond of the style of prayer articulated by Borowicz. I actually prefer prayers authored by the Puritans, or those composed in the mid-1600s by Anglican Thomas Cranmer in the elegant Book of Common Prayer. When I’m placed in these kinds of public settings, I try to pray in a way that is sensitive to others who may not share my same beliefs. Moreover, I don’t agree with every policy that Borowicz praised. So, if it were up to me, I would have prayed differently. Nonetheless, the response to Borowicz is over the top. What her critics are actually doing (in the name of tolerance and diversity, ironically) is trying to censor religious speech under the veil of “taking offense.” Of course, they’re fine to have people pray who agree with their particular agenda. But if you have a person who displays a genuine faith in a God who makes real claims on one’s beliefs and behaviors that contradict their agenda, then that goes too far. Liberals would love to have you discuss your religious beliefs, so long as those beliefs don’t conflict with their goals. The Left would prefer to have religiously motivated people and opinions move to the back of the bus of American public opinion. Keep your religion to Sunday morning, and we’ll handle the rest of the week, thank you very much. What the whole situation calls for is a renewed sense of true tolerance. As Americans, we hold deep convictions about many issues, including issues of faith. We need to come to the place where we can listen to each other express these convictions. We need to hear each other, respect each other, and then engage constructively with each other. Faith-shaming those who hold religiously informed opinions does not serve these ends. Jeffrey S. Trimbath is the Executive Director of The Center for Vision & Values at Grove City College. He has served in a number of policy, development and management positions in government and the nonprofit sector in both Washington D.C., and his home state of Pennsylvania. He earned his Master of Divinity from Gordon-Conwell Theological Seminary and is an active member of his church.